Donald Trump ratcheted up his racist fearmongering in last night’s acceptance speech. 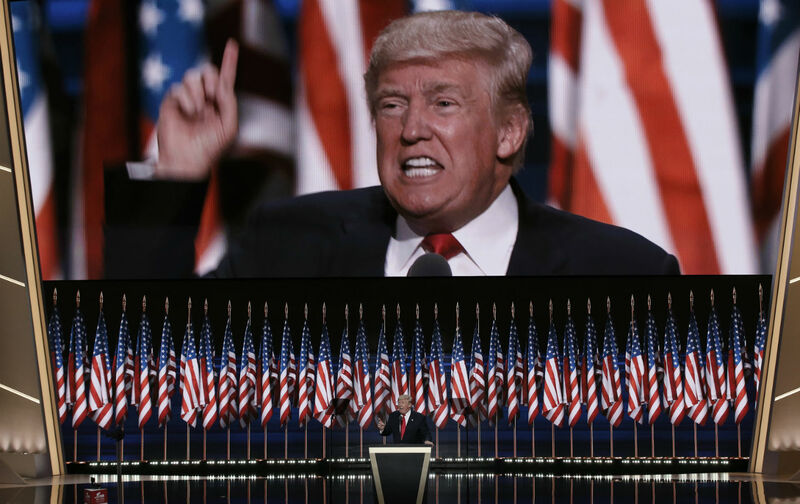 Donald Trump, the newly minted Republican presidential nominee who opened his primary campaign with fearmongering about Mexican “criminals, drug dealers, [and] rapists,” on Thursday evening accepted his party’s nomination by ratcheting up his fearmongering. This time he warned about the dangers of immigrants who are, in his imagination, murderers. Trump leaned on a tragic story of a young woman’s murder to prop up a generalized depiction of immigrants as menacing, homicidal animals “roaming freely to threaten peaceful citizens.” On Thursday Trump highlighted Sarah Root of Nebraska, a 21-year-old who was sitting at an intersection in her car in January when she was fatally rear-ended by a 19-year-old undocumented immigrant named Eswin Mejia in a drunk-driving accident. Mejia was charged with felony motor vehicle homicide in February. Trump generally cycles between a handful of similarly devastating stories; this story was well-trod territory for the Trump campaign. But his remarks Thursday were orders of magnitude more threatening, more bleak, and more terrifying. The truth? Unfortunately, anxiety about immigrants is difficult to unravel from tangled fears about crime, legality, and people who are black or brown. Let’s try. In 2015, Immigration and Customs Enforcement reported that between fiscal years 2010 and 2014 the US government released 121 unauthorized immigrants who went on to be charged with a homicide-related offense. For some perspective, in 2010 alone the FBI noted that more than 15,000 offenders were involved in just under 13,000 homicides. And to slice it another way, there are an estimated 11 million undocumented immigrants in the country, meaning that Trump’s remarks about homicidal immigrants were relevant to roughly 0.0011 percent of all undocumented immigrants. There’s more. In the 23 years between 1990 and 2013, the foreign-born share of the US population grew from nearly 9 percent to 13 percent, according to the American Policy Council. During those years the undocumented-immigrant population tripled. Also during those years, violent crime declined 48 percent. All this as the federal government has rapidly expanded immigration-law enforcement, and expanded the list of criminal offenses that can make a non-citizen deportable. Root’s death, as painfully tragic as it is, is not representative of immigrants, or even undocumented immigrants. Trump’s anecdotes, and his sacrificial-virgin language, can easily obscure that truth. But that’s just as intended.